Dallas Jessup created a video that teaches girls how to fight their way out of dangerous situations. 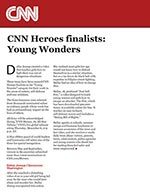 (CNN) -- Three teens have been named CNN Heroes finalists in the "Young Wonder" category for their work in the areas of autism, self-defense and race relations. The three honorees were selected from thousands nominated online as ordinary people whose work has had an extraordinary impact on the lives of others.